The high-octane novelty act that is the boisterous buddy actioner, The Hitman’s Bodyguard, should, by the estimation of studio heads, bring the blistering high-wire shenanigans to shakeup the late August box office blues. The draw — other than the grandstanding of flashy explosions, animated gunplay and calculating car chases — is obviously the rollicking rapport between hedonistic hotshot leads Samuel L. Jackson (“Kong: Skull Island”) and Ryan Reynolds (“Deadpool”) as the titular characters. The flippant give-and-take chaos that surrounds Jackson and Reynolds does, in fact, provide some occasional irreverence. 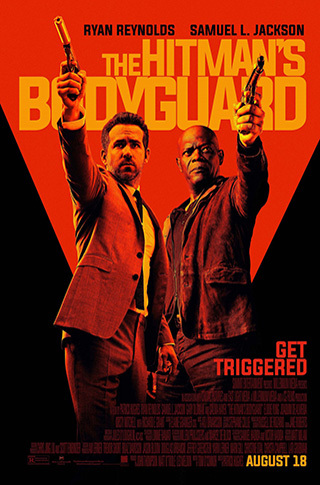 However, The Hitman’s Bodyguard ultimately shoots anemic bullets with its empty-minded comedic violence, intermittent broadened jokes and devil-may-care carnage that has all the charm of an uncontrollable rusty buzzsaw. Reynolds stars as Michael Bryce, a once highly paid “protection specialist” whose top-notch bodyguard duties were on demand by the elite crowd that paid top dollar for his specialized services. However, Bryce experiences a major setback when one of his privileged clients — a Japanese bigshot with prominent pull — becomes a victim of a sniper’s assassination. This instantly ruins Bryce professional reputation and he loses everything in the process. Soon, Bryce will be contacted by his ex-lover and Interpol official Amelia Roussel (Elodie Yung, “G.I. Joe: Retaliation”) as she and her associates are assigned with transferring notorious hitman Darius Kincaid (Jackson) to the International Criminal Court at the Hague to testify against ruthless Belarusian baddie, Vladislav Dukhovich (Gary Oldman, “Tinker Tailor Soldier Spy”). Unfortunately, Amelia and her fellow agents botch the mission to transport Kincaid and may be hampered by some unscrupulous characters within the international police system. Amelia and her handlers cannot afford to be compromised by leaks within their ranks and need a serious backup plan concerning Kincaid’s travel arrangements. So in order to win back his ex-lover’s heart (and his own confidence and capability as an efficient protection agent) Bryce agrees to help Amelia and her team to get the targeted Kincaid from England to The Netherlands in one piece at the prescribed hour otherwise Dukhovich will automatically go free (a bewildering court ordered stipulation). Naturally this will be a tall order to complete as there are tainted sources within the international law enforcement establishment and colleagues of the dastardly Dukhovich standing with guns in the way. Thus the challenge begins as the conflicted Bryce must ensure the safety of one criminal to guarantee the permanent incarceration of another. The stakes are high for both Bryce and Kincaid to try and co-exist as they embark on their risky adventurous trek through incredibly mindless — yet entertaining — banter. The golden questions are in full force: Can the gun-toting globetrotters survive each other’s mutual disdain while ducking and dodging Dukhovich’s nefarious operatives? Will the shady Interpol moles out to discredit Bryce’s holster-wearing honeybun jeopardize her powerful position? Furthermore, can Kincaid’s guaranteed presence at the Hague once and for all save the world from Dukhovich’s poisonous wrath should he be unleashed from the court to continue his heavy-handed sordid sins? As previously mentioned, the selling point in The Hitman’s Bodyguard is clearly Reynolds’ fastidious Ying to Jackson’s furious Yang. The playful bickering between the beleaguered bodyguard and lippy hitman as the turmoil unfolds has its few chuckles here and there. Darius Kincaid fills in nicely as a second tier acerbic gunslinger, but one would probably favor Jackson’s other famed hitman in his Oscar-nominated turn as the Bible-quoting extinguisher Jules Winnfield from 1994’s classic “Pulp Fiction” more. Reynolds serves as an adequate partner-in-crime straight man whose personal strife is juicy ammunition for the problematic pairing. While Jackson’s and Reynolds’ on-screen antics methodically fuels this fast-paced farce the inclusion of exploding cars, reckless speedboats racing on European canals, a busload of singing nuns and random bothersome killers taking numerous potshots all add up to a bunch of hyperactive hokum. There is nothing distinctively original or inviting about the suspense as the zany madness jumps from one imaginative locale to another without much purpose to fortify the string of sketchy action sequences. Director Patrick Hughes injects his brand of badboy behavior with powder keg punch (as seen in his “The Expendables 3”), but nothing really registers beyond the Jackson-Reynolds cockeyed camaraderie. Supporting players such as Kincaid’s hair-triggered spouse Sonia (Salma Hayek, “Beatriz at Dinner”) and Oldman’s diabolical dictator Dukhovich are effective in so much as they have fun stealing the few scenes they are assigned. So although nothing special, perhaps the dead end of summer will turn The Hitman’s Bodyguard into a welcomed distraction worth aiming your box office bullets at . . . it most certainly beats embracing the fun-loving naughtiness of an emoji. Very well written. Sounds like the kind of bombastic film that may translate in to a big office hit. There’s always room for more murder and mayhem to substitute for thinking. Seem a bit to silly for me:Good review tho. One of the more successful genres that doesn’t take much effort to make is the ‘buddy cop’ movie. It’s as easy as adding a ‘wild’ character with the ‘straight’ character and throwing ’em into situations that’ll get them butting heads. Does Samuel L. Jackson ever play against type? He’s been doing the same damn character for 20 years…..
Great review but the film is so familiar. Same story with different actors chasing cars, blowing up things and usually the characters are two men of different races. Seen it a hundred times and don’t care to see it again. Nice job on the review though.